Published by Charlesbridge. Order now! Rose Ann Tahe (Diné) was born into her mother’s clan, the Red Running into the Water Clan (Naaneesh’t’ezhi Tachii’nii nish’li), and born for her father’s clan, Salt Clan (Ashiihi bashish’chiin). Rose held a doctoral degree in elementary education leadership and a master's degree in elementary education. Rose died in 2015; her son and three daughters are glad that their mother’s dream—to publish a book about the First Laugh Ceremony—has come true. 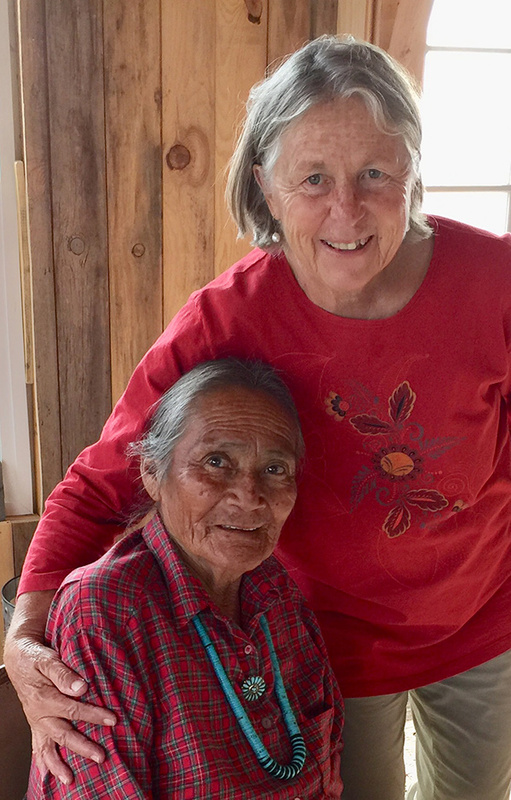 Nancy Bo Flood lived on the Navajo Nation for fifteen years, where she met Rose. Nancy was a research psychologist and studied brain development at the University of Minnesota and the University of London before writing books for children. She has a special interest in legends and folklore. 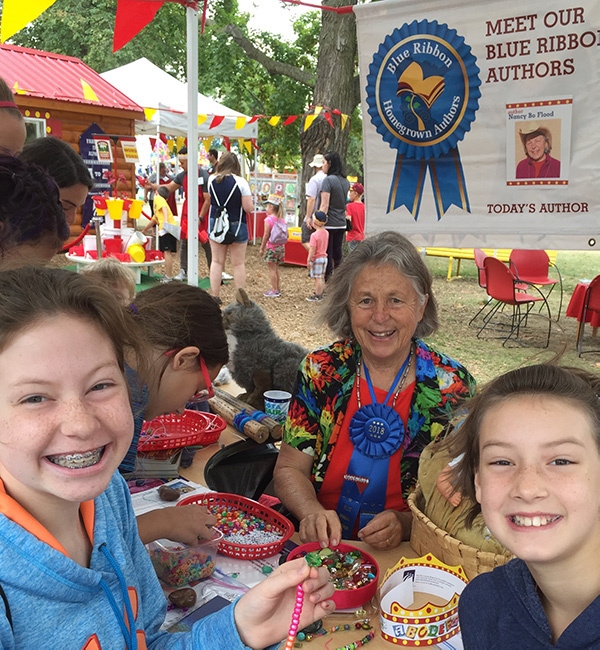 Her titles include Soldier Sister, Fly Home; Warriors in the Crossfire; and Cowboy Up! Ride the Navajo Rodeo. Selected for Notable Social Studies Trade Books for Young People 2019, a cooperative project of the National Council for the Social Studies (NCSS) and the Children’s Book Council. On the short list for the Reading the West Book Awards 2018 in the Picture Books category, presented by the Mountains & Plains Independent Booksellers Association. Recommended in 'Books That Celebrate Cultural Traditions' at the Colorado Parent website. Bank Street Best Books, 2018. Video designed by Steve Palmquist, Winding Oak. “First Laugh, Welcome Baby: Laughter is a holy gift for the Navajo people. Frolicking humor is woven into this charming story like the wool fibers of a traditional Navajo rug.” - S.D. Nelson, Standing Rock Sioux Tribe, award-winning author and illustrator of Greet the Dawn — A Lakota Story. A Navajo family waits for baby’s first laugh. Who will be the first to hear it? Will nima-sami (grandmother) hear it, as she tucks Baby in for a nap? Will it be big sister (nadi), who cooks Baby a tasty meal? Maybe it will be nima (mama), who sits weaving while Baby rests in a papoose. Or will it be cheii (grandpa), who splashes Baby with water? Everyone in the family is waiting, kissing, tickling, hugging, and singing, as Baby squirms, yawns, frowns, until… suddenly… a smile! Let the First Laugh celebration begin! 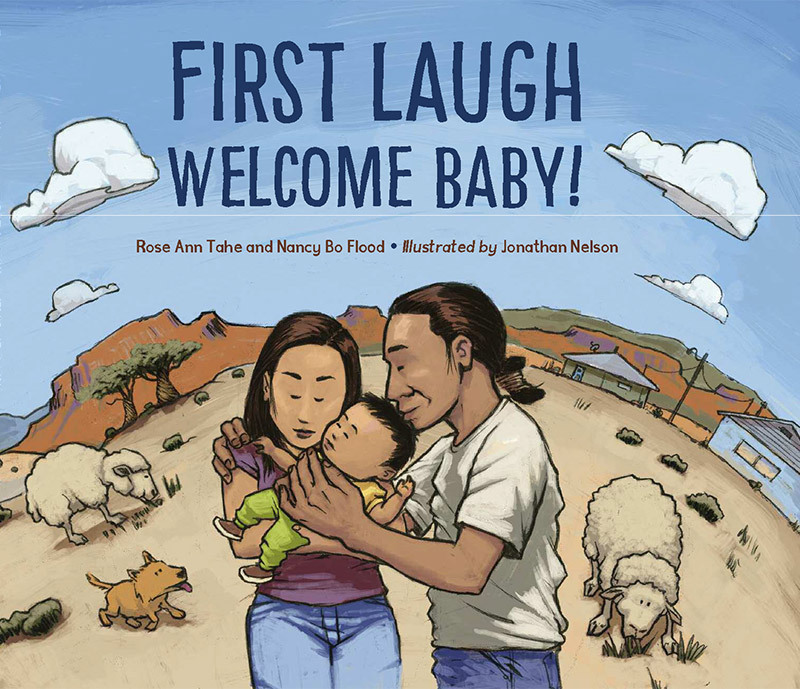 First Laugh Welcome, Baby is a beautiful look at a Navajo tradition; the First Laugh Celebration is a child’s first formal welcome into a family and clans. 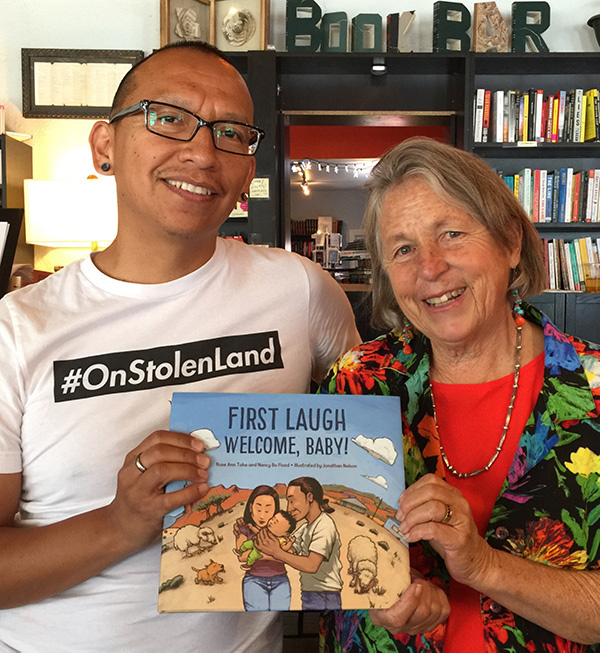 The lyrical story is filled with Navajo words and glimpses of Navajo life, woven into a story about the joy of a baby’s first laugh and the celebration it brings to families and communities. Jonathan Nelson’s pencil, acrylic, and Photoshop artwork create a loving portrait of a family that spends time together both in the city and on a Navajo reservation; they eat together, enjoy nature together, and socialize together in settings primarily illustrated with earthy tones and bold lines. Back matter includes author’s notes from the late Rose Ann Tahe and Nancy Bo Flood, and an illustrator’s note from Jonathan Nelson; a note about the First Laugh Celebration, and ceremonies in other cultures, including Muslim, Nigerian, and Jewish families. Nancy Bo Flood’s Soldier Sister, Fly Home is a powerful middle grade story about a Navajo family; First Laugh is a wonderful picture book that introduces younger readers to First Nation families. Please, please, please, put these and other books by indigenous authors and illustrators in your bookshelves and in front of your readers. 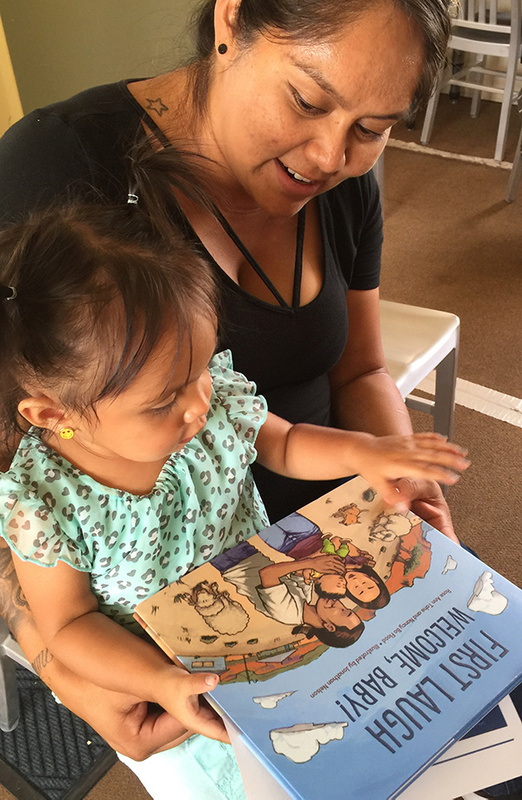 At the Tuba City Library, a visitor at the book launch reads First Laugh to her daughter.